This movie featured many WB stars including Joan Crawford, Danny Kaye, Gary Cooper and Ronald Reagan. The title song was nominated for an Academy Award. Two films for Doris this year. Billy Wilder's future partner I.A.L. 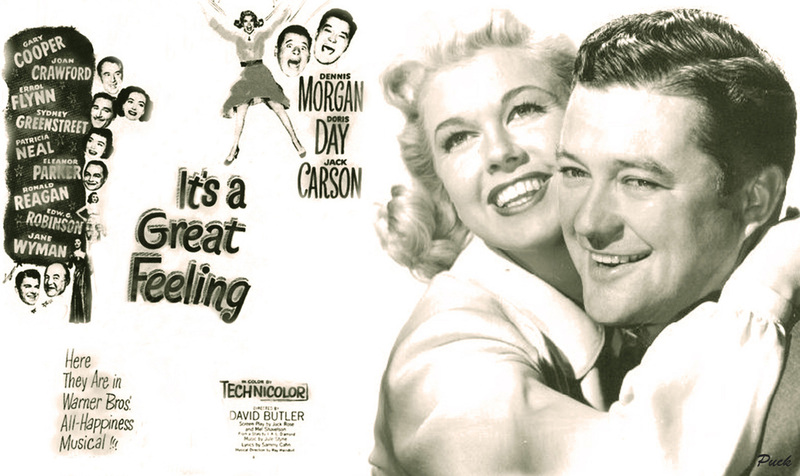 Diamond concocted the storyline for this Dennis Morgan/Jack Carson/Doris Day tune fest. Morgan and Carson, Warner Bros.' answer to Bing Crosby and Bob Hope, appear as themselves. Attempting to line up a director for their next picture, the boys find themselves unable to do so due to Carson's gigantic ego. Carson decides to direct their next vehicle himself; the next problem is locating a leading lady who'll be willing to put up with Carson. The boys discover Doris Day, a waitress in the Warner Bros. commissary. Carson and Morgan spend their entire shooting schedule vying over Day's affections; she gets fed up with this, and heads back to her home town in Wisconsin, there to marry her childhood sweetheart Jeffrey Bushdinkel--who is revealed in the final shot to be none other than Errol Flynn! Other guest stars popping in and out of It's a Great Feeling include Gary Cooper, Joan Crawford, Sidney Greenstreet, Danny Kaye, Patricia Neal, Eleanor Parker, Ronald Reagan, Edward G. Robinson and Jane Wyman. Also appearing as themselves are such Warner Bros. directors as David Butler (the real director of It's a Great Feeling), Michael Curtiz, King Vidor and Raoul Walsh. Jack Carson: But Dennis! Dennis, you've got to help me find a leading lady. Look. We're pals! Buddies! When you first came to Hollywood, down on your luck, broke, didn't have what to eat, who gave you the first square meal? Jack Carson: Well, who phoned them? Dennis Morgan: Who gave you the nickel? Jack Carson: It was a slug! Jack Carson: [after being slapped] What was that for? Joan Crawford: Oh, I do that in all my pictures.